This is the first time in as long as I can remember that we’ve gone out of town over spring break. We typically avoid traveling on this common week like the plague, but since Parker is elementary school this year, we have to abide by the dreaded school schedule. It actually didn’t turn out to be bad at all in the way of crowds and traffic. We wanted to go somewhere nice and warm, but we didn’t want to drive an entire day to get there either. So, we decided to make an overnight stop in Orlando, stay two nights, and drive on to Ft. Lauderdale where it was nice and warm for the beach, and then stop again in Orlando on the return home. We love Destin, but this time of year can be hit or miss on the weather, and if we’re doing all that driving and spending money, we want to make sure that we’ll at least have a few warm days. Since we decided to make a pit stop in Orlando, we thought it would be nice to do Legoland for one day. Dan and the boys went to Legoland last fall break and loved it while Sienna and I went to Disney for the day. So, we thought it would be nice to go as a family and also meet Dan’s Parents down there during our visit. It is only a short drive from their Florida home, and the kids loved getting to see and visit with them, as did they. The kids all had a great time and I loved that they had short lines and lots of rides for the little kids. There were lots of fun roller coasters that all three kids could ride! 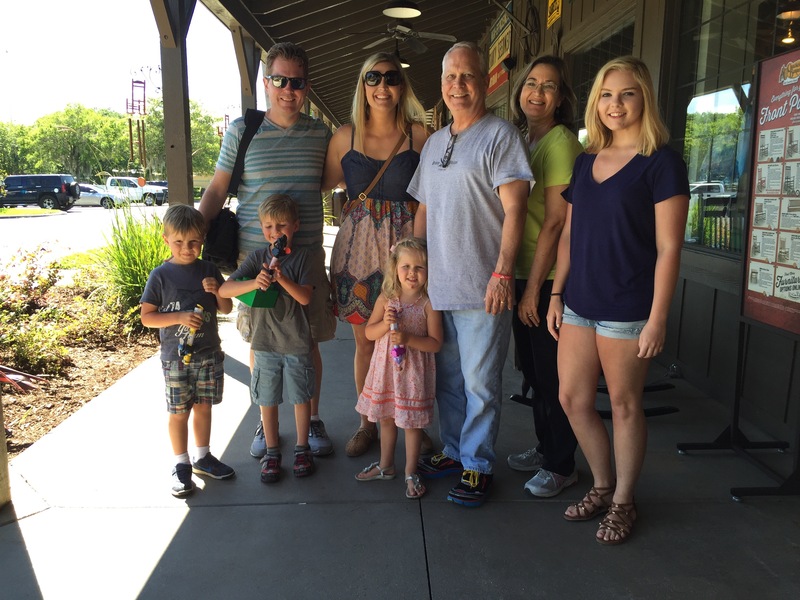 I failed to mention at the start of this post that we invited my sister Amanda to join us on the trip. She. Is. Wonderful. She was not only a big help, but it was so nice to have her along and connect with her that week since we rarely get to see each other. She is a senior this year, and will be off to college in the fall and we will probably see even less of her. So, she braved the craziness that is our family, and agreed to join us for a week of family (mostly) fun. We headed down to an amazing house near Ft. Lauderdale after our stay in Orlando. Dan found an amazing place on VRBO again called Waterfront Tropical Oasis. Yes, it is as amazing as it sounds, and I gave it a glowing review after our trip. It was absolutely perfect! This was the first time we didn’t stay on or very close to the beach, but it was still just perfect. Only a few miles from the beach, and so much to do right at the house! They had kayaks for the waterway right in the back yard, a pool for the kids, floats, grill, tons of seating. They even had bikes if we all wanted to ride, but we didn’t get around to doing that. This was the first time we had been to Ft. Lauderdale as a family, so there was a bit of a learning curve as to where things are, what is great to do, etc. We went the first day into town to do a duck tour. We thought it would be a great way to get acquainted with the area. Although their website says nothing of the fact, turns out they closed their Ft. Lauderdale office months ago. So, we wandered the beach instead even though it was super windy and overcast. Then we decided we’d just stay a bit afterall and enjoy the beach and sunshine. One thing that we didn’t know about Ft. Lauderdale, is how close it is to the florida everglades. Supposedly, it is a major attraction for the area to go on the air boats in search for alligators. Since we had never done this before, the adventure sounded intriguing. When in Rome, right? So, we found a tour that takes you down there, and organizes the trip on the boat. We had a great time! I can’t lie though, I was a bit scared once we were out there and realized there was only about a foot of metal edge between me and the water where the alligators are. It turned out to be fine, but I was a little on edge in the beginning. Then, before I knew it, the tour was over, and I almost left feeling like it wasn’t long enough. Maybe it was because I was too much in worry-mode to actually enjoy it. Nevertheless, it was a fun experience and one we’ll always remember! We were so thankful that Amanda graciously watched the kids so that we could have a date night, too. The last time we did a date night on vacation, it was an absolute disaster. We’re so glad that the kids had someone they knew and loved watch them so that Dan and I could escape our loud super sweet kids and enjoy some time alone. We went to a fun place called Coconuts, and it was a big hit. I definitely recommend this place if you’re going to the Ft. Lauderdale area. Make sure to order the Scoobies!! They’re known for them. So delish! We also just enjoyed time at the house. One night we all at boxed ice cream from the freezer while we warmed our feet in the outside hot tub. One morning, the kids woke up and immediately got their suits on and swam all morning, and we headed to the beach after that. I tell you what, it’s been so much easier this trip knowing that we have two boys that can swim rather well. They’re also tall enough to reach the shallow end too, so if they get tired, they don’t need to swim the entire time. We made lots of great memories just hanging out there, enjoying the pool! Our last day in Ft. Lauderdale, we discovered Lauderdale-by-the-Sea. After we got there, we were kicking ourselves for not discovering it earlier in our trip. We had just set our directions to take us to Ft. Lauderdale, so it took us further south. This particular area was closer to where we were, and super quaint with stores, lots of seating, very dog friendly, live music, areas for kids to play games, a fishing pier to walk on and soak in the amazing views. It was just an overall fantastic place. We also discovered an amazing ice-cream place called Sloans. Super eclectic and it was fantastic. Exactly what we needed to put the ‘cherry on top’ of our vacation in Ft. Lauderdale! On our way back to Orlando, we visited with a new addition to the family, Summer Grace Hopkins. My cousin Alisun and a sweet baby girl that we were able to hold and visit with. We also got a chance to enjoy a nice lunch with Norris and Liane. It was so nice to get to see everyone! What a blessing sweet Summer is! Overall, it was a great vacation. There was lots of time to connect with family, and just take it easy and forget the hustle of life. I hope the kids look back on the trip and remember good memories of a fun time together as a family. Easter seemed so early this year! It really snuck up on us right after Mason’s birthday. I took the kids down the road by our house a few days before Easter to get pictures of them in their Easter clothes since rain was forecasted. It is amazing how much easier they are to photograph now as opposed to just a year ago. They listen so much better! I think they’re probably a bit used to the drill since I take so many photos of them! I’m really happy with how they turned out. The boys were wearing outfits grabbed last minute from Target. They didn’t have a lot to choose from, and I like their Easter outfits to be casual enough to wear to church on other days as well. Sienna got her dress at the Spring consignment sale that I go to every year. I love getting her dresses there since they’re always very cheap, and she typically only wears the dress once. This is the one time a year that I try to do a photo shoot of my kids and practice my photography skills. I’m happy with the results! The kids also enjoyed fun egg hunts and parties at school as well. They had a great Easter party. I was especially impressed with Mason who had memorized the entire Easter story with the resurrection eggs! The kids had a lot of fun this year at Easter. We didn’t let the light rain ruin our egg hunt and spending time with the family. We had a great time at Aunt Vicki’s house in Decatur. We visited with Angie, Robby, Hannah, Jake and his wife Sarah, Patrick, Drew, Anna, and their two kids Jackson and Davis, and Mark and Jessica with their three kids Carson, Cooper and Presley. Of course, the gathering was hosted by Vicki and her husband Phil. Parker, Mason and Sienna really enjoyed the egg hunt, and visiting with all the cousins! This year Davis and Copper got the golden eggs! Parker got a yellow egg, and he was convinced that it was THE golden egg, so he stopped looking for the two hidden eggs. It’s hard to believe that we have been married eleven years! When we talk about our early years of marriage it’s such a different life than what we have now. It’s funny because we’ve been talking to the kids more about some of our travels we did before they were born. Parker was asking about the Eiffel tower and if I had ever been. Then we got on the subject of scuba diving, and we talked about submarines and helicopter rides that we did in Hawaii many moons ago. Things have changed over the years for sure! We’ve definitely had some adventures, but have had some hardships as well. One thing remains true. Dan makes me a better person, and I love him more every year that we’re together. One way we love to connect is travel. 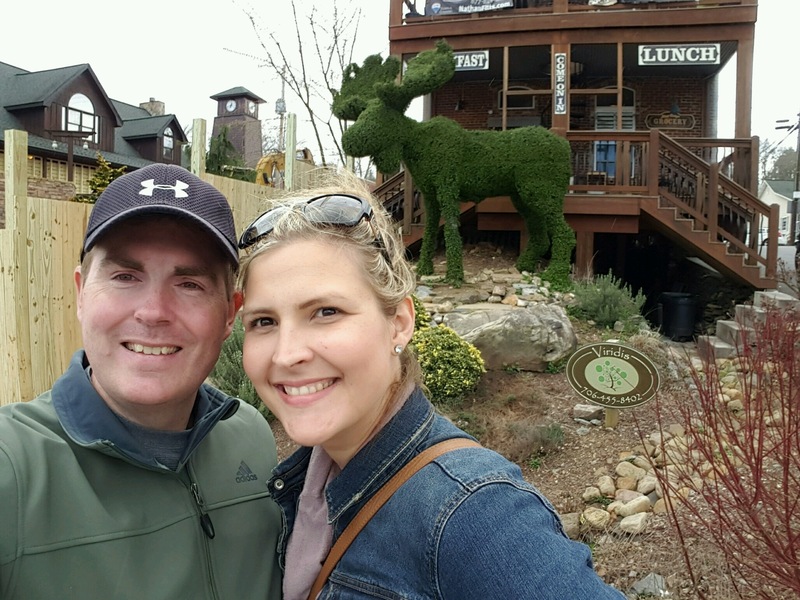 We love our kids, and we really enjoy going on trips with them, but there’s something about getting away without the kids that brings us right back to where we were early in our marriage. A time when we were more intentional with our time together, without the interruption of little ones needing our time and attention. This is what we did when we decided to go to Blue Ridge to stay for a few nights. It was such a great getaway! Dan found this cute little log cabin (another reason why my husband is amazing) that was just perfect. Honestly, if you’re looking for a nice, affordable place to stay near downtown Blue Ridge, this is such a great place. It is a two bedroom overlooking a valley with a view (in the early spring at least), quiet and peaceful, with a great outdoor hot tub. We were really impressed with the town of Blue Ridge. I had not been there in years, but the shopping was great there. We were very disappointed with downtown Helen last year, even though the place we stayed (Lucille’s Mountain Top Inn and Spa) was nice, the town itself left more to be desired. It was also nice not to have to rush in the morning to get to breakfast. We’ve felt the need to do this at previous B&B’s so we didn’t miss out on the food. With this cabin, we didn’t rush at all. We woke up slow and got to sleep in and it was heavenly! We’d definitely stay there again! We found a fun trail on our way to Blue Ridge just outside the falls called Fall Creek Falls. It was absolutely beautiful and it had a rocky, mossy enchanted forest feel heading up to the falls. One nice bonus, the path was super quick and easy for a hiker of any skill level. We didn’t want a super long trail because we wanted to get to the cabin and clean up and head to town. In town, we ate at several Restaurants. All of them were delicious! My favorite was Harvest on Main. We got a table on their front porch during the day on Saturday for lunch, and they had great food! They menu was different without being too weird. I like weird, but Dan likes familiar! We actually ran into some good friends of ours as we were leaving the restaurant. It was so fun to be in the exact same place at the same time so far from home! We welcomed the hello from them, and then enjoyed some nice shopping after. I found myself some super comfortable italian leather shoes from a company called FLEXX and Dan found a knife store, and git a survival-type collection that had been discontinued, so we were both happy campers. We really enjoyed each other’s company the entire day. It brought me back to being a newlywed! We also ate at Blue Ridge Brewery which was also nice, but we didn’t drink their beer, so we can’t really give a full review, although the food we got was tasty. Dan loved their pretzel. I got a blackened trout that was D-lish! We ate breakfast twice at Serenity Garden Cafe. Their food was good, but never had any fresh fruit, which I found pretty odd. I was doing the whole 30 at the time, and really wanted a fruit option. Their food wasn’t bad, the atmosphere could’ve been better, but not bad for a breakfast place. For our Anniversary evening, we went to Cucina Rustica. It was a little outside of town, but a very nice upscale Italian Restaurant. How we came to eat at this restaurant is kind-of a neat story. We met an elderly couple on the streets of downtown Blue Ridge. They were coming out of a restaurant and we were asking them about good places to eat around the area. We got to talking and come to find out he was Tom Ledford, the town’s county commissioner, and the person who helped get alcohol into the restaurants in Blue Ridge. It was a dry town for a long time! I had no idea that even existed, I mean, sure everywhere was dry back in the day, but this was recently, like within the last ten years. They said you were allowed to “brown bag” wine and bring into restaurants, but the restaurants couldn’t sell it. So, he recommended his buddy’s place who helped him get elected to the board, and they were ultimately able to pass beer and wine. I’m glad they recommended the place too, because it was very nice and the food was delicious. I got an appetizer of bacon wrapped lamb and a salad, Dan got a ravioli dish. I indulged in wine and dessert since it was our anniversary and it was heavenly after over two and a half weeks of being good on the Whole 30! Dan also gave me the sweetest necklace for our anniversary. No hints at all, he picked this out on his own. I will certainly treasure it all the days! Overall, it was such a nice time of bonding with my sweetie. I truly value our marriage, and I am so glad that God brought us together. He makes me so happy. I decided I’d change up the blog a bit and do a vlog instead. I hope you enjoy! Left to Right, top to bottom: Meatballs with spaghetti sauce and cucumber, tomato green leaf salad; Blackened Trout (restaurant) with asparagus; Ripe banana mash with almond butter and coconut flakes; shrimp with stir-fry veggies; mixed green salad with tomatoes and balsamic dressing, and grilled Cod; Smoked sockeye Salmon with spinach greens salad; Mixed greens salad with Turkey meat; cucumber, avocado and tomato salad. Drinks: Mainly water with lemon, but also Lacroix was such a delicious treat! It is Whole 30 approved! I also enjoyed my morning cups of coffee, but with unsweetened coconut milk instead. Surprisingly, I like it better! I had quit sugar in my coffee years ago, so that wasn’t an issue for me. I’ve also gotten used to drinking unsweetened ice tea and it’s not so bad at all! Here are two of my most favorite recipes that can be Whole 30 approved! Pre-heat oven to 350. Place the fish in the center of the foil, season with salt and pepper and drizzle with olive oil. Place a slice of lemon on top of each piece of fish, then a sprig of herbs on each. Fold up the edges so that it’s completely sealed and no steam will escape, creating a loose tent. Depending on the thickness of your fish, cook 10 to 15 minutes, or until the fish is opaque and cooked through. My porgy fillets took about 12 minutes. Now add the cream and the salt, lower the flame and let cook for 1 minute, or until the cream reaches the desired thickness. I also enjoyed modifying regular meals like Spaghetti and meatballs, without the noodles, and baking bone-in chicken with compound butter under the skin with fresh herbs. Also, Applegate has fantastic breakfast turkey sausage that has very few calories in the frozen section. It takes only minutes to warm up in a pan. For lunches I did a lot of leftovers from the night before. Whole 30 doesn’t have to mean spending all day in the kitchen! The two recipes above are super fast, and both are delicious! It’s so amazing if you can find a friend or have someone partner with you on the journey. I had two friends Danielle and Ashley that were both doing the whole 30 around the same time as me and also a neighbor who had just finished. They have offered so much support and encouragement and that has been WONDERFUL to have! I failed to mention that I lost weight during the Whole30. I’m sure you guys probably came to that conclusion watching the video, but I meant to say something about that. 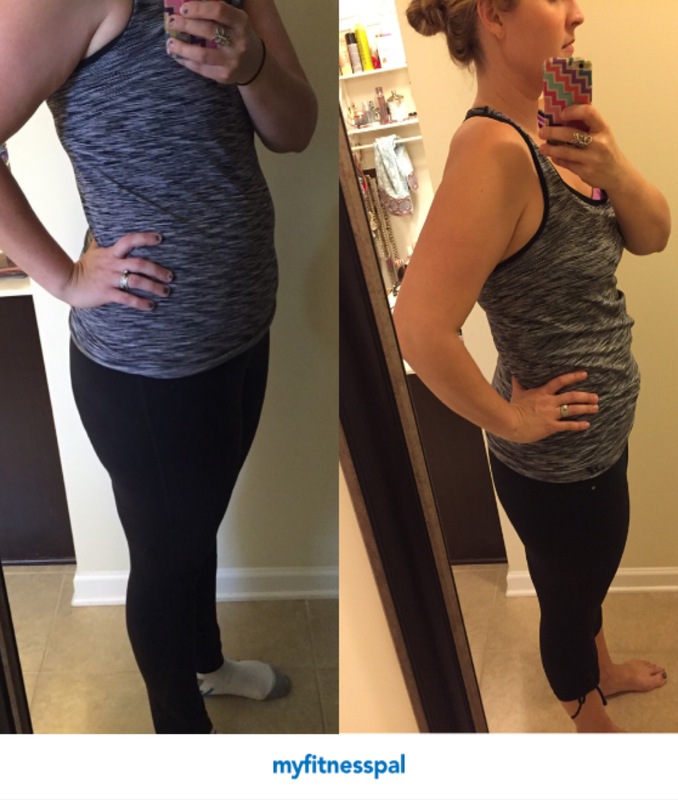 I have lost a total of 13lbs! I would’ve loved to have lost more, but I think that’s a pretty big accomplishment for such a short period of time. My work isn’t done either. I will continue to log calories and exercises in myfitnesspal until I reach my goal! In addition to the clean eating, adding meals to myfitnesspal and Whole30, I have also worked out diligently during the last month. I regularly go to Body Pump (a strength training class that uses a bar with weights) 3x a week, use the elliptical 2x a week, and go for 2 mile walks around the neighborhood 2-3x a week. I had a lot of energy to do so while eating on the Whole 30! Here’s a not-so-great before (left) and after (right). I plan to continue my weight loss journey and have a better picture to show by the end of summer! We had such a great time celebrating our sweet boy! We had his party at a fun indoor trampoline park called Get Air. He and some of his best buddies; Allie S., Allie C., Alex, Kai, Noah and of corse Mason and Sienna enjoyed jumping and celebrating! He told me it was the best birthday party ever, which makes me feel like we’ve done a great job. Not just with selecting the party location, but with raising a kid who is appreciative and thankful to be celebrated. He asked for a specific Lego City set that was an arctic mining station. He really enjoyed building it with the help of his brother, and has loved playing with it! We also got him some digging supplies since he’s such an outdoorsman and loves any reason to dig and explore in the woods! We decided it would be fun to try doing a photo booth this year over the holidays. This was our first adventure with it, so we weren’t sure what to expect. My friend Ashley of Ashley Bruschi Photography was a big help with loaning me her flash, and educating me on what camera settings would be good with the flash… because I have NO clue when it comes to using an external flash. It’s whole new world for me! I found the backdrop on Amazon (we decided to do black because it’s more forgiving with shadows), and we got a few of the fun glasses on Amazon as well, and then the rest of the props came from the local Party City. We had two Christmas parties at our house this year. One was a ornament exchange with a few close friends and neighbors, and the other was our family Christmas Eve gathering. For the family gathering, unfortunately, we didn’t get as much participation because it was just to chaotic with all the kids, but it really is a fun way to capture an event. It’s challenging to photograph adults at a party. I think kids are a bit easier because they can turn on the charm and goofy-ness. A photo booth is just the thing that turns grown adults in to goof balls themselves. Well, and alcohol helps too, I suppose. I can’t tell you how many good belly laughs we got from these silly props and poses. It was a big party hit. We had a great time celebrating the holidays. It’s no surprise that I am a big fan of Christmas. Anyone that knows me knows that I love the whole shebang. The music, the decorating, the lights, shopping, Christmas outings with the fam, cooking, visiting Santa, hosting parties, and all the holiday festivities that go along with it! The first thing we did to get into the holiday spirit, was run/walk the Lake Lanier Under the lights 5k. We did this last year, and it really is a fun event to do. Not only that, but I love the time I spend with Dan, running and being goofy out there together. You get to see lots of light displays during your run, and the jolly man himself. It’s a great atmosphere. It’s something that we enjoy and would like to continue doing every year! We enjoyed a tree lighting ceremony in Avalon. This was our first year attending the tree lighting ceremony there, and it was nice. It was super cold, and a bit crowded, but we ran into some friends, and it turned out to be a really fun evening. This may end up being a tradition each year leading up to Christmas! Mason and Sienna took to the stage with their classes to sing Christmas songs for the holidays. This was Sienna’s first time singing and she did great! She loves singing, and is always animated with her movements when putting on a performance, and Mason isn’t shy about singing either. It was super precious and we enjoyed every bit of it! It was kind of sad this year going to Cookies with the Clauses because I remember taking Parker as a toddler, when Mason was just a baby. My how the times have changed. Now Mason and Sienna are attending without big brother because he’s in Kindergarten. In a blink of an eye! Next year Mason will be in Kindergarten as well! Sienna and Mason had a great time. We met a few friends there, but we were waiting in line for a while for Santa and Ms. Clause that we didn’t get to visit as long as we would’ve hoped to. No Christmas would be the same without our annual visit to Kinsey Farms. We decided to go on a weekday this year because it’s always been super busy on the weekends. Although, this is a Christmas Tree farm, they’re not typical Christmas trees that they grow there. They’re leyland Cyprus, and other green trees, but Fraser firs are what people typically get, and they aren’t grown in this area. They’re mostly grown in the Appalachian regions of NC. They are trucked into Kinsey farms, but we still love the atmosphere of the farm, and it has certainly become a tradition of our family. Even though Mason and Sienna managed to dump hot chocolate all over them, and they burned their marshmallows several times, we still managed to laugh about it all. I love our crazy family! When we got home, we got busy decorating the new tree! We decided to do colored lights this year, which is the first time we’ve done this. I noticed that they don’t photograph as well as the white lights, but it was fun to use the for a change! We had planned to visit Santa at North point mall, but they are just too fancy. I mean, for realz, fancy!! In order not to have to wait in a line for a long time, I planned to do a reservation. Except this year in order to make a reservation at North Point Mall Dreamworks Santa, you had to pay ahead of time for the pictures too. Say whaaaat? Who does that? I mean… this year happens to be the first year that we don’t have a kid afraid of Santa, but if we did then we’d be up a creek with crappy photos. I’m just not a fan of paying for photos you’ve never seen. I think I’m pretty normal in that degree. It is a fancy set-up though. They allow you to design your sleigh, and you go on an interactive ride in your sleigh prior to meeting santa. We may try it next year, but Dreamworks needs to get a reality check before next year and not require the pre-pay for photos in order to reserve. So, we went to Avalon instead, which turned out to be a great experience anyways. The only thing that was a bit of a let-down was the weather. It was literally 70 degrees! Not very Christmasy but we made the best of it. After a sweet visit with Santa, and a wonderful staff that allowed me to take MY OWN photos for free, Parker begged me to take him ice skating. It was so expensive that we could only take one child, and we told the others that they weren’t old enough and they’d have to wait until next year. Dan took them to the soft play area and Parker and I took to the ice. It was so slushy from the weather that Parker fell several times into the wet mess. However, in true Parker fashion, he laughed and laughed and didn’t mind one bit. Just like when he was learning to ride a bike. He never got upset or frustrated, he just laughed, got back up, and tried again! I need to remember this when I’m frustrated by the fact that he’s a goof ball and won’t be serious…I’m thankful that he also has the type of personality that doesn’t take himself too seriously and knows when to laugh it off, even if it’s the hundredth time falling in slushy ice and soaking your pants from the waist down! We were overjoyed to be able to host Christmas Eve in our home this year. We typically go to Angie’s house, but we asked if we could host, and we were so thankful that she not only agreed, but was happy that we offered. I know we live a little further out, and we were excited that everyone was able to come up and spend such a special time in our home. We had a table full of appetizers and desserts, and we enjoyed catching up with family, and we watched a short clip from the movie Nativity that talked about the birth of Christ, and the true reason why we celebrate the holiday. In years past, we have done everything from reading scripture, to singing Christmas Carols, to sharing prayers, and we decided to change it up, and put our stamp on the night. All the young kids are excited to open “stocking stuffers” from family members, of course too. Truthfully, I may be equally excited to see the joy and smiles on their faces! Overall, it was a big success! We were exhausted, but everyone had a great time and the kids were tired by the end, but still excited for Santa to come and for Christmas morning. We enjoyed a relaxed morning at home Christmas Day. The kids big gifts this year were a dollhouse for Sienna, remote BB8 for Parker and Mason got a Lego AT AT. Aunt Angie hosted Christmas lunch at her house this year, which was really nice because typically the family Christmas Day lunch is held at the farm, which is too far for us to drive with the kids. It was nice to visit more with family and get to see my grandparents that weren’t able to make it on Christmas Eve. We had a wonderful relaxing Christmas!